Win a $100 Gift Certificate to Zed451! Congratulations to Kathy Riedel on winning our 110th High Five Giveaway and thank you to all who entered! 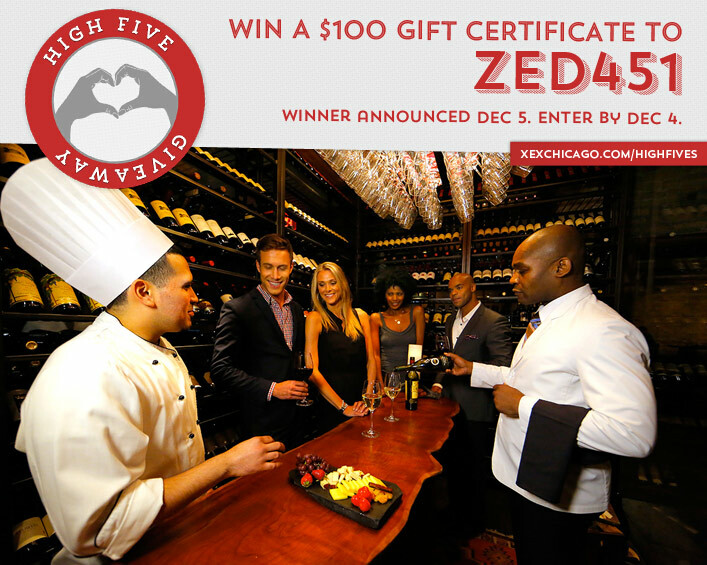 Our next High Five Giveaway is for a $100 gift certificate to Zed451. Named after the last letter of the British alphabet and the temperature at which fire ignites, ZED451 delivers a personal culinary experience from start to finish through the perfect blend of fire-grilled fare, hand-carved rotisserie, and an assortment of fresh sides and harvest salads. Their chefs bring expertly prepared cuisine directly to your table, allowing you to taste the best of the season in a warm, urbane setting in the heart of Chicago. Dine in the round, immersed in global flavors without pressure – you determine the variety, portion and pace of your meal. Whether you are looking to sample a few favorites, indulge in a full-course dinner or relish their house-infused specialty cocktails, we invite you to ZED451 where, together with their chefs, you create the experience. Zed451 is located at 739 N Clark Street, Chicago. Visit their website at www.zed451.com or call them at 312-266-6691. What is a hairstyle that is popular this winter? There are no wrong answers! Check out our recent blog post for some possible answers. Now, just add a comment to this post with your answer to be eligible to win! The winner will be announced on Friday, December 5. Entries must be received by midnight on Thursday, December 4. Good luck! LOW PONYTAIL AND SIDE BANGS ARE IN FOR WIN-TER! Braids are popular this winter and is my go to protective style! Long hair with loose curls! Longer wavy angled bob. Looks good with hats and can just spritz when take hat off! An updated version of a 60’s hairstyle with side bangs is a popular combination for the winter. Personally, I love the volume factor and this looks super cute with my reverse ombré hair ! I’m still seeing lots of fishtail braids and they’re super cute! I’m sure they’ll stay around for a while.